EDITOR’S NOTE: PLEASE NOTE, THE BAKE SALE IS NOW CLOSED. PLEASE CONSIDER MAKING A DONATION DIRECTLY TO THE GOWEN FAMILY AT Luck2Tuck, c/o Webster Bank, 100 Main St. North, Southbury, CT 06488. THANK YOU! What follows was, as you will quickly see, written by a very special guest. One who likes big letters and bold fonts and has a penchant for exclamation points. One who also has a nasty habit of teasing her mama and who never, ever ceases to amaze me. 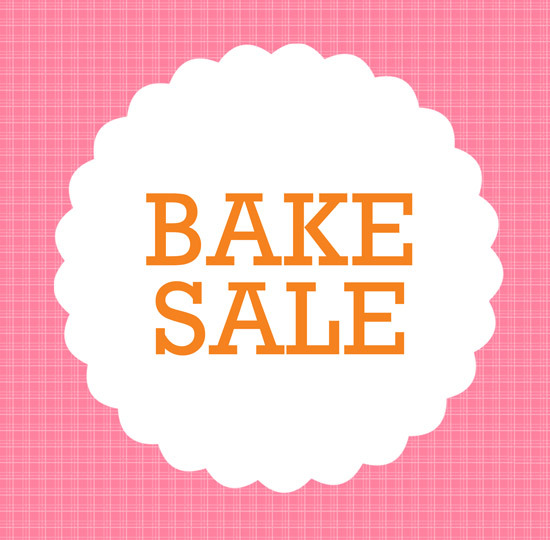 I’m doing an ONLINE bake sale (I repeat, ONLINE!) for a young man named Tucker (Tuck) Gowen. Tuck has Leukemia, which is a form of cancer. He’s been in the hospital for more than SIX MONTHS now and quite frankly, I’m guessing he’s really, really bored. I can’t stand sitting in one spot for five minutes let alone six months, so I want to get him something that would relieve him of his boredom while he’s still stuck in the hospital. Tuck is a musician, so I am raising money to buy an awesome high-tech keyboard that plugs into his laptop. It’s a special kind of keyboard that he can use even while he’s in bed. After coming up with my brilliant (if I do say so myself) idea to buy him a keyboard, I ran into one major problem. Where will I get $800.00? Then, while I was cleaning my guinea pig’s cage, it hit me. I’ll do a bake sale! I picked up the phone and dialed my mom’s work number. I explained my wonderful (if I do say so myself) idea. After explaining, my mom thought silently for so long, I almost thought she hung up on me. It turned out she was just crying. (She does that a lot. And when I say a lot, I mean a LOT.) Anyway, after this extremely long silence, she pointed out my new major problem.Where would I do this bake sale? We brainstormed and brainstormed, and came up with a few ideas, such as my school and my old school. Eventually, we settled on the idea of doing an online bake sale. We will take orders online until October 15th. (We won’t be sending anything until then, so it might to take a while to get your stuff!). To read the back story on Tuck as written by his mom, Jeni, click HERE. (Just make sure you have tissues nearby). To follow their story on Facebook, click HERE. To place an order or make a donation, please go to Pay Pal (WordPress has gone all wonky on me and won’t let me make this a link, so here’s the URL — https://www.paypal.com/webapps/mpp/send-money-online) and enter diary4luck2tuck@hotmail.com as the recipient.) After you enter the amount of money you’d like to send, a page will come up asking you to review your payment. On the bottom of that page, you will see the words “Email recipient.” Under those words is a Message field. In that field, please write your full name and address and your choice of brownies, cookies or a combo thereof. If you prefer to make a donation and not receive any of the items listed, please specify that in the comments so we don’t try to hunt you down (other than to thank you!). How do you know this isn’t one big scam to take your money and run? Well, I guess you don’t. But I give you my word, which means a lot to me. And I’m pretty sure that Jeni will vouch for us, along with just about everyone we know in real life. So there’s that. And when we get Tuck the keyboard, we will post pictures so that you’ll know that it got to him. Is your donation tax-deductible? Nope. I can barely manage to get myself dressed in the morning no less create a charitable foundation because my kid wants to have a bake sale. So I apologize, but it’s not. You do, however get a rebate in really good karma. What if we only take in $200.00? Then what? Then we’ll figure out another way to raise the rest of the money. Tuck *will* get the keyboard. What if we take in more than the $800.00 needed to buy the keyboard? Then we will, together with the Gowens and the Child Life staff at Children’s Hospital, figure out how the funds can best be spent to make life more comfortable for the other kids on Tuck’s floor. If that happens, you’ll know that too. Thank you. Thank you for participating in my kid’s quest to make Tuck’s life just a little easier, a little more comfortable, a little more musical. I could not be more proud of my sweet girl. She never ceases to amaze me with the depth of her generosity and the warmth of her spirit. She is, along with her sister, the greatest gift imaginable. Thank you for loving her with me and for helping her to do this. 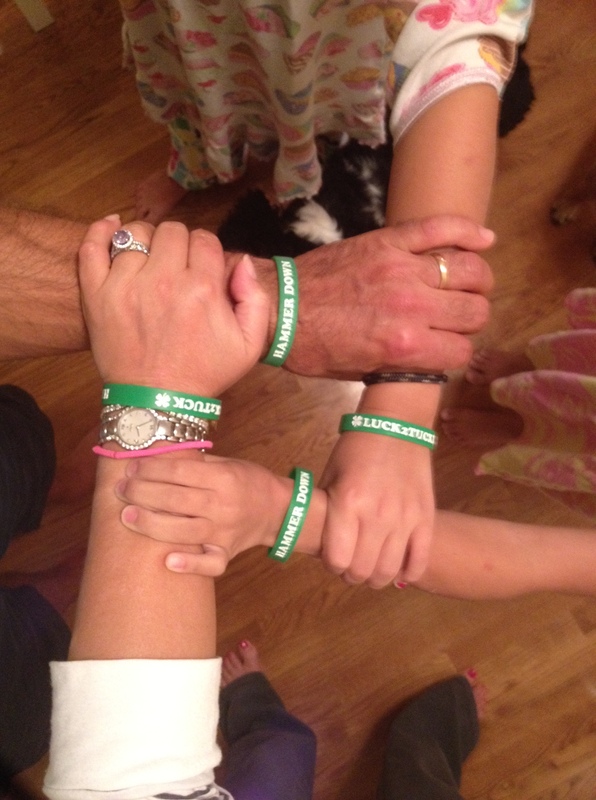 Oh, and this is what the super cool Luck2Tuck bracelets look like, as modeled by us. Are you on Twitter? Please tweet the following and help us reach more people! Thank you! Fantastic idea. Since we will be coming up this weekend, we will bring our donation with us. I am so proud of KATIE!!!!!!!!!!!!!!!!!!!!!!!!!!!!!!!!!!!!!!!!!!!!!!!!!!!! Busy gets busier! Bless you, bless you, bless you, Wilson family! This is awesome, and I know Katie will do great! What an awesome idea. I wish you the best of luck Katie! Money is tight over here right now, but I will see if i can find a few dollars to spare for your very good cause! Help! The backstory link just returns to Katie’s post. I’d love to re-read the post from Tuck’s mama. I am so blessed by Katie’s heart to help. Will be donating as soon as I get my boys off to school. What an amazing, awesome, wonderful and super duper fantastic idea!!! You guys rock….just rock!!!! I will be placing and order or making a donation!! I love this idea — way to go Katie for dreaming up this idea — I always love to read your writing!!! Y’know, lots of people come up with great ideas, it’s the really special ones who put feet to them and put them in motion! Just went to paypal, originally tried to send to Diary4Luck2Tuck, but got straightened out. Jeez, Katie. Fine. I will be donating. I’ve been saving up to buy Photoshop for myself, but you’ve convinced me that I can wait a little longer and send some money for Tuck instead. You’re a good kid, Katie. I’m like your mom. I cry a LOT too. 🙂 Don’t make me do it again, m’kay? WOW – that is fabulous – I am sending my order now! Katie – You rock! I just donated and can’t wait to read about you reaching your goal for Tuck. You had me at cookies! Heading over right now to donate. What a marvelous (and delicious!) idea. FABULOUS idea… A few bucks have been sent your way… And chocolate chip are my favorite!!! 🙂 GREAT CAUSE… GREAT IDEA…. GREAT KIDDO!!! Katie: You make your momma proud!!! This is a fabulous idea!! Is there a way that I can just send you a check in the mail, I would love to donate! Please e-mail me @ and let me know where to send the check to if possible. Thank you! Please put your order details (cookies? brownies?) and your address in the envelope as well. I too would love to donate! Is there a p.o. box I could send it to? Could you email it to me? My only request is that you and your wonderful family eat my donation’s worth in cookies or brownies. You all deserve them! I live near ‘cancer alley’ and a couple hours from MD Anderson. Unfortunately, we can get numb to the dx and the tragedy. Just in my small town of 3,000, we’ve had 3 cancer dx in the past 2 weeks, one being a 17-year-old. Katie’s passion and desire to help has inspired me, though. I’m going to reach out to the families today and see if there is anything I can do. Oh, Katie, your big heart has me in tears. I hope you know how proud your mama is. Oh Katie…I would like a little of everything…for $75, is that possible? Either way, there will be a donation on the way via mail asap. Katie, “what can I do to help?” is a phrase too few people think and even fewer act on! I just sent you some money via paypal, and you should send the cookies or whatever to someone you think could use them, okay? The world is a better place because you’re in it. I sent $15 but didn’t get an opportunity to add a comment : (. We totally don’t need cookies although I’m sure Katie makes excellent ones. I would love to get a bracelet, though so when you get the money from panzaverde4@hotmail.com , my address is 4532 Ladoga ave., Lakewood, CA 90713. Thanks. I just sent a donation and tweeted it too. Let me know if there is anything else I can do. I’m sending prayers for Tuck and his family and I liked their FB page. Please donate our cookies to your local Ronald McDonald house or family shelter. I ordered them with my donation from Indianapolis. I am SO impressed with you caring soul.